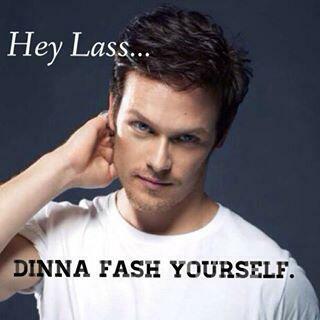 The Heughligans and other Outlander fans have been working hard to promote the books and the upcoming Starz series. One of the Facebook groups (Caisteal Dhuni) even has that as its mission. And I think we’re being successful at getting attention from both general media and the Starz people who recognize the devotedness of the fans. We were all very excited when we got Sam on E!News as the Hottie of the Week twice in a row, but then discouraged when his IMDB numbers went down after a huge jump the week before. But we need to realize that we aren’t going to win every battle and we need to not get discouraged if something doesn’t go as we expect and some battles are probably better suited to our numbers and enthusiasm than others. We will keep getting the word out and bringing in more people so that by the time the series airs we will have good viewership numbers to keep it going. The brilliance of Diana and the cast and crew will do the rest. Well, we had our first big stumble, but I think we learned from it. There was some confusion over at Caisteal Dhuni about Craig Ferguson’s likely reaction to everyone trying to get a shout-out to Sam. They suggested it and it sounded like fun to me so I reposted it over here. Then we were pretty quickly asked to stop spamming him and so we tried as quickly as possible to get everyone to stop sending tweets and an apology was sent. Hopefully, they won’t hold it against Sam who had no idea what we were doing. In penance, we should all buy his new DVD- I’m here to help. So, what we’ve learned is that in the future we should be careful to only aim our powers at professional not personal accounts, and preferably those asking for feedback, like the E!News Hottie of the Week awards. I think it’s also important to realize that this is not an international crisis though, and life will go on. Learning from mistakes is part of being human and we don’t want it to discourage us from continuing to get the word out about all things Outlander. Realistically, I think this is a long-term rather than a short-term project. As far as I can tell, it is very natural for those numbers to rise and fall dramatically week-by-week. They are a huge site with billions of page views per month and millions of professionals in the business of making television and film (according to them). There are thousands of Heughligans, but even if everyone were visiting the site frequently, it’s not enough to make a substantial difference. And IMDB has designed their algorithms to try to be resistant to small(ish) groups of users trying to affect the ratings. I think the reason the number had gone down so much before was that the announcement that he was Jamie drew a lot of initial attention and searching. Some of us stayed crazed interested and continued to visit and check him out, but I suspect most people noted the information and then went back about their lives and are waiting for the show to actually come out before checking back in again. Now I suspect that with each announcement of a new major cast member, the new person’s number will improve and Sam’s will a bit also as a lot of people will likely look at both of them. And I also suspect that there will be a sustained improvement once the shows are actually airing. All that being said, his number is still very good. See here for some context about the numbers. I think our best bet for helping improve this though is what we’ve been doing- get the word out about Outlander and the series. The more fans the better. I think the IMDB ratings are more an indicator than an end in and of themselves- and one that we should look at over time not stress about on a weekly basis.